Bicycle rentals Dupnitsa, bicycle hire Dupnitsa. The most convenient and cost effective way to RENT A BICYCLE IN DUPNITSA, BULGARIA. We offer a wide range of bicycles for rent via Motoroads.com - mountain bikes, city bicycles, touring, racing, city, hybrid, ladies, electric and bicycles for kids. Our Dupnitsa bicycle rental fleet in Bulgaria is built of reasonably priced new and used bicycles available at low rental rates. All kind of professional bicycle gear, accessories and equipment rental is available upon request in order to make your cycling adventure pleasant and safe. Being long in the cycle hire service, we know what you expect from us, and how to treat you. Bicycle rental in Dupnitsa. Our rental fleet consists of ON-ROAD, XC [cross-country] or MTB [mountain] bicycles. 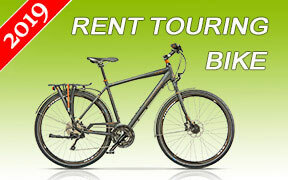 Booking online a bicycle for rent in Dupnitsa is quite easy and takes a minute. If you wish we will deliver the bicycles to the place you stay in Dupnitsa. Renting an on-road, cross-country or MTB bike is probably the best way to experience Dupnitsa and Bulgaria. Upon bicycle collection, we will give you friendly road and map orientation. DUPNITSA - Bulgaria » The town of Dupnitsa is located on the banks of German river at the northwest foot of the Rila mountain. It is 38 km south of Kyustendil, 33 km north of Blagoevgard, 40 km west of Samokov and 65 km south of Sofia. Interesting landmarks in the town are the clock tower from 1782, the historical museum, the remains of the Kulata fortress, St St Elena and Konstantin Church, the Holy Virgin Church from 1789, and St Nikola Church from 1844. Sapareva Banya spa resort and Panichishte resort are 14 km away from Dupnitsa. Contact us for our bicycle rental services in Dupnitsa.